This article appeared in the 2018 January issue of Sea Magazine. New layout and design cues complement the quiet ride and maneuverability Prestige is known for. HULL #3 OF THE Prestige 460 was so new that its first visit to the fuel dock was just before our trip in Southern California from Newport Beach to Long Beach. As Bayport Yachts owner JR Means and I waited for more than 300 gallons of fuel to slosh into the tank, we checked out the swanky Garroni design. 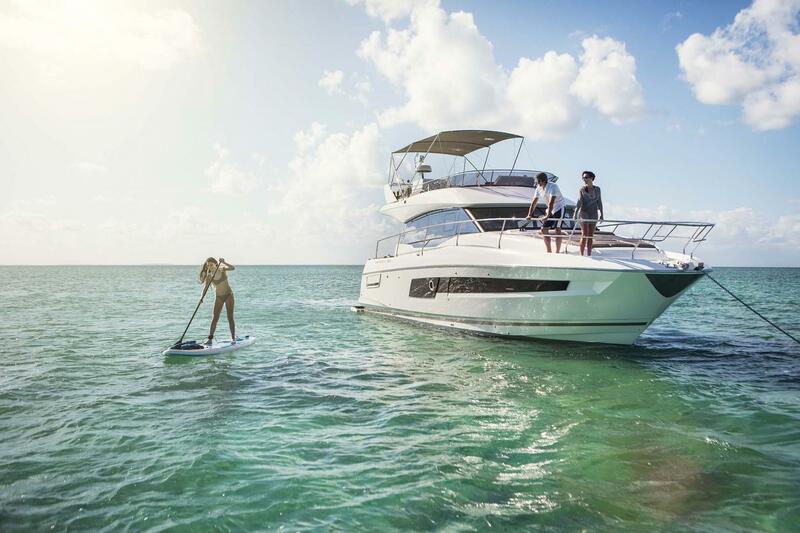 Although it shares the same hull with its predecessor, the Prestige 450, which it also replaces, the refreshed model features new deck and interior layouts and follows design cues from its recently introduced larger siblings, the 630 and 680. And while the 450 did well, with the redesign, it seems good just morphed into better. The changes that make the 460 enticing are visible immediately. The massive hydraulic swim platform carries up to 500 pounds and makes launching the tender easy, because it submerges a full 32 inches below the surface. It’s a $27,000 option but well worth it considering owners can now stand on it and cook at the optional outdoor galley that juts out from the transom. The cockpit also gained a bit of room and teak decking is now standard. The forward-facing transom settee has been replaced by an L-shaped lounge in the starboard corner. It wraps around a high-low table and sits just ahead of a lazarette that is so large it can house optional crew quarters complete with a bed, a head and its own A/C. A hatch on the cockpit sole provides access to the machinery space, which includes the Volvo Penta engines and pods and the standard 13.5 kw Onan genset. Due to the low headroom, the space is limited but workable for engine checks. Getting aft to the pods is a bit of a squeeze. At the other end, the bow gained a lounge. No ordinary sunpad, this feature now includes popup headboards that form two chaise lounges complete with cupholders. An awning lifts up from the deck to form a superyacht-style cabana. The center cushion can be removed to reveal a skylight and a hatch, which bring light and air to the VIP stateroom below. Readers counting along will note that the bow sunpad is the second outside area for people to gather. 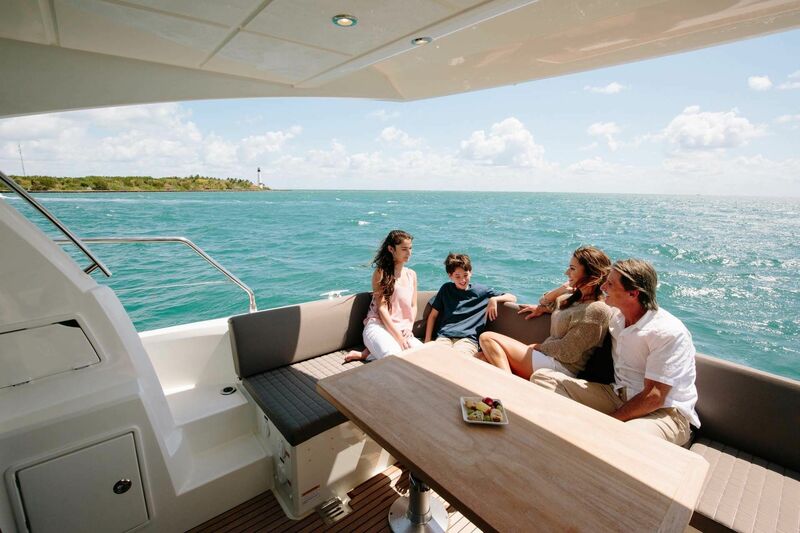 The third — and of course the magnet for most outdoor social activity — is the flybridge, which houses a second outdoor galley (optional), another sunpad for two and an aft dinette. The helm, to port, has a Raymarine display, a joystick, engine throttles and a seat that looks to be built for one and half humans. The steps that lead down to the cockpit are a bit steep, more like a ladder really, but two good railings provide plenty to hold onto during the descent. Inside, the 460’s layout is different than its predecessor. By removing the signature second staircase that normally leads down to the secluded master stateroom on other Prestige models, the company created a master that is now 30 percent larger. The full-beam stateroom shares the forward stairs with the guest cabin but doesn’t sacrifice much in terms of privacy. It has an en suite head, a bed on the center-line and a lounge next to one of the large windows. To port is a dresser whose top drawer flips up to form a vanity mirror. It’s quite the posh pad. Of course, the VIP cabin in the bow runs a close second. As mentioned before, plenty of light and air pour in through the overhead hatch and skylight, but there are also hull windows and opening ports. 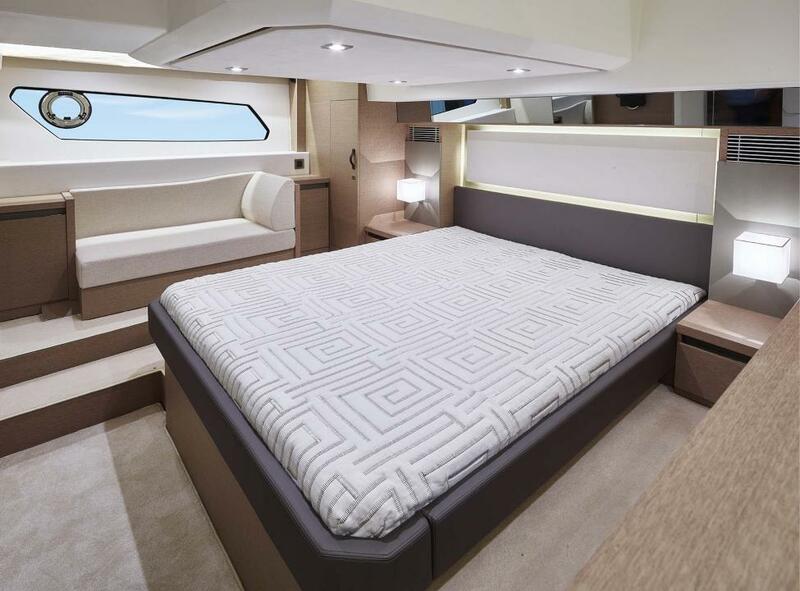 The centerline bed splits into two single berths. Just lift the aft ends and pivot them outboard. This versatile cabin will work for a couple, guests who can share a room but not a bed, or kids. An optional washer/dryer can be installed under the steps that lead up to the salon. On the main deck, the galley is still aft to starboard. 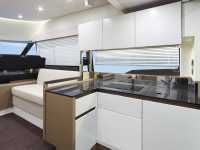 It can easily be used to serve guests at the interior portside dinette and in the cockpit. The chef will enjoy the convenience of a ceramic cooktop and a separate oven at knee level. A standup refrigerator and freezer combo is hidden behind matching wood paneling to port. The salon is two steps up, which raises it enough so seated guests get a near-360-degree view through the newly enlarged windows. 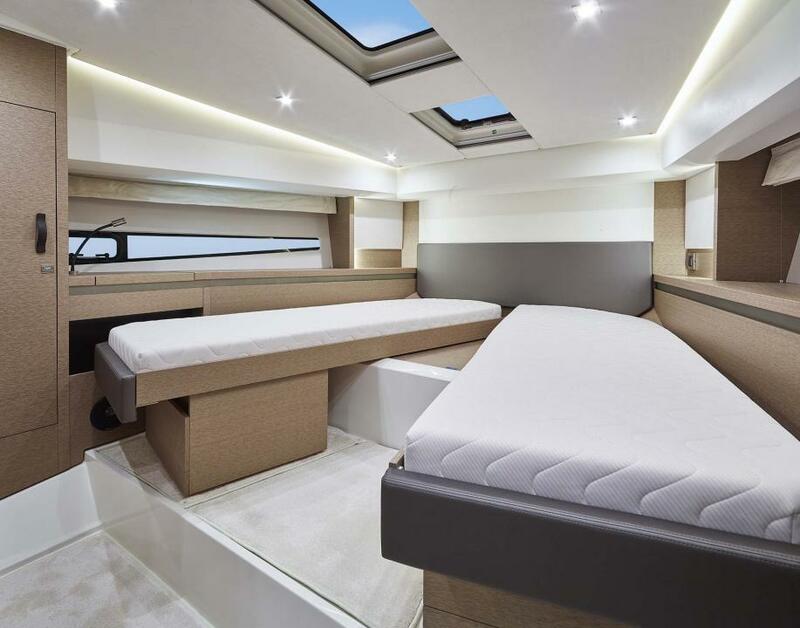 Five to six people can sit on the U-shaped settee that wraps around the foldout table to port, and a matching straight settee to starboard will fit additional guests. Nice touches include a bottle locker and digital switching via a Scheiber display panel. To starboard, the helm is well laid out and compact, so most controls are easy to reach. Twin 12-inch Raymarine ES125 MFDs — touchscreens with a control wheel to the right — sit on an angled dash behind the wheel. They’re easy to see but hard to reach from a seated position. It would be nice if the control panels were outboard on the side pad and closer to the driver, but that’s already a crowded area, home to the Volvo Penta joystick, the bow thruster joystick and the engine throttles. Other instrument interfaces include the Volvo engine display, the EV-2 autopilot and the Raymarine 260 dual-station VHF radio. Two cupholders, an opening side window and air vents provide comfort for the driver, and the dash is covered with a matte paint that cuts down on glare and windshield reflection. Altogether, buyers can opt for three pod joysticks, including one in the aft cockpit. For anyone thinking that’s overkill, let me say that it’s the best place from which to dock, especially backing into a slip. With each iteration of the line, Prestige has stepped up its fit and finish. Under-standing aspirational boating, the company knows that the owner of a 46-foot cruiser really wants to feel like he has a (smallish) superyacht and everything that implies. Our test boat featured gray oak wood surfaces — Means calls it “driftwood,” for better marketing appeal — and white headliner panels and white matte lacquered cabine-try that fit well with the Marline Pure White leather upholstery and leather handle accents. Sound-dampening fabric panels added to the feeling of luxury. Some folks might not believe it’s a production build. We made our run up the coast at a cruising speed of 24 knots on a glorious Southern California day. Behind the Los Angeles Harbor jetty near Cabrillo Way Marina, we slowed down and put the boat through a few tests. It handled beautifully, making precise turns and taking just eight seconds to plane. Circling back over our wake, we felt no slamming or rolling. With the upgraded 435 hp IPS 6 engines, the 46 Fly topped out at 32.5 knots at 3600 rpm, where the engines burned about 45 gph. At a 24-knot cruise, the boat’s range is more than 200 nautical miles, depending on sea and wind conditions. Once again, I noticed how quiet the Prestige line is — hardly a creak to be heard, even at speed. The hard-chine hull was designed from scratch to accommodate Volvo Penta IPS pod drives, which I never tire of, because they’re fun and easy to drive. 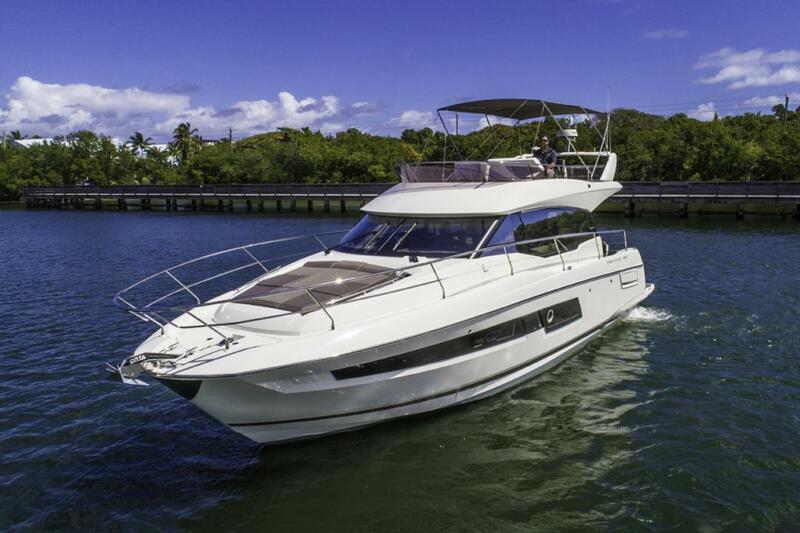 The Prestige 460 will make driv-ers look like a rock star and take the anxi-ety out of docking. Owners may find them-selves wanting to go out and drive for any reason, just like when they got their first car. If we hadn’t been on a schedule, I’d have stayed out all day, maybe popping over to Catalina Island for a signature Buffalo Milk. There’s really very little not to like on the Prestige 460, and that’s pretty good for a fresh-out-of-the-box model that hasn’t yet had the benefit of owner or dealer feedback. The larger swim platform and transom galley along with the wider cockpit and roomier master cabin are nice evolutions, while the quiet ride and the easy maneuverability that Prestige is known for continue. With four years of feedback and some creative thinking, good did indeed just get better — much better. There’s really very little not to like on the Prestige 460, and that’s pretty good for a fresh-out-of-the-box model that hasn’t yet had the benefit of owner or dealer feedback. 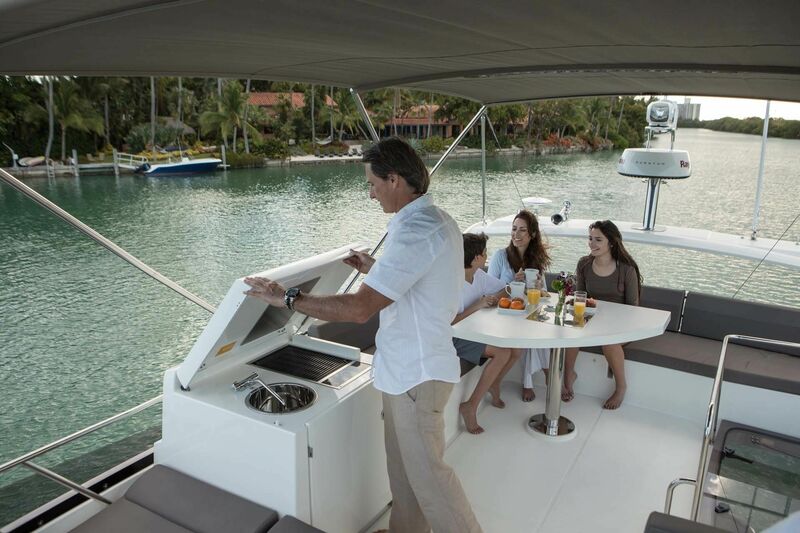 The larger swim platform and transom galley along with the wider cockpit and roomier master cabin are nice evolutions, while the quiet ride and the easy maneuverability that Prestige is known for continue. Standard Equipment: Twin 370 hp Volvo Penta IPS500 engines, Onan 13.5 kw genset, bow thruster, swim platform, microwave/stove/refrigerator, window defogger and more. Optional Equipment: Volvo Penta IPS600 435 HP diesels, elec-tronics package, custom hull colors, crew quarters, joystick in cockpit, foredeck Bimini, aft cockpit retractable sun awning, Glendinning CableMaster shore-power cord management, underwater LED lighting, washer/dryer and more.